Java 10 now supported by all components in the pack. The ExcelExporter class from com.mindfusion.diagramming.export package exports diagrams to Excel Open XML format (XSLX). Diagrams are exported as Excel AutoShapes drawings. The export overload that takes a DiagramDocument parameter creates a sheet for each DiagramPage in the document. The export(Diagram) overload creates a single Excel sheet. Caption text of TableNode and ContainerNode objects can wrap to multiple lines in plain-text mode. Table cell text can wrap to multiple lines in plain-text mode too (i.e. when EnableStyledText is disabled). TextPadding now works for ContainerNode captions. Automatic layouts should now preserve shape of multi-segment links in containers. Fixed exceptions in CascadeLayout and LayeredLayout with LinkType set to Cascading. Fixed LinkLabel loading code from old XML diagram formats. Virtual Keyboard control added to the pack. MindFusion Virtual Keyboard is an on-screen keyboard component that enables text and shortcut input through touch, mouse or stylus events. It is implemented as a Java Swing control and can be easily integrated with any application running on a JVM (Java virtual machine). The control works similarly to software keyboards of mobile devices, letting users input text into the currently focused entry field. It is especially useful for applications running on touch screen terminals, such as POS or industrial systems. 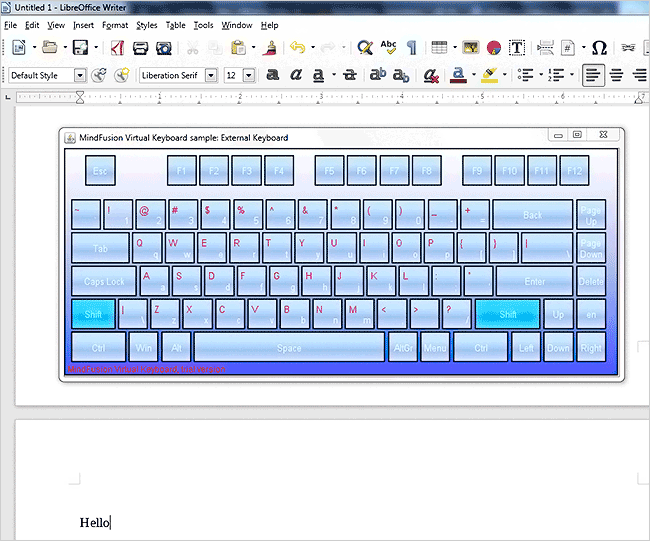 The integration of an onscreen virtual keyboard can also be used to enhance traditional desktop applications with accessibility features. Virtual Keyboard has been tested with the most popular Java development environments and JVM languages, and is used by companies from all around the world to create applications for various operating systems.